Pfizer has lately seen both positive and negative impacts of Korean biosimilars concerning its global sales. The company said its fourth-quarter sales of Remsima, also known as Inflectra, in the U.S. market increased to $70 million, up 58 percent from a year ago. The company's annual earnings of the biosimilar also stood at $259 million, up 119 percent from 2017. Remsima is a biosimilar of Remicade, developed by Celltrion, and is a chimeric monoclonal antibody biologic drug that treats autoimmune diseases such as Crohn’s disease, ulcerative colitis, psoriasis, and rheumatoid arthritis, among others. Pfizer has been exclusively marketing the drug in the U.S. market since December 2016. 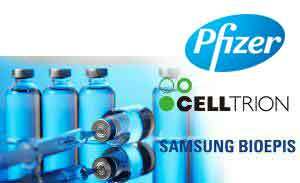 In Europe, however, Pfizer’s Enbrel (ingredient: Etanercept) has seen its sales significantly decrease due to Samsung Bioepis’ Benepali. Samsung's Benepali is a biosimilar referencing Enbrel, developed by Amgen, and treats rheumatoid arthritis and psoriatic arthritis. Pfizer currently sells the drug outside of the U.S. and Canada. According to the fourth-quarter earnings report of Biogen, Samsung Bioepis’ marketing partner for Benepali in EU, the biosimilar’s sales increased 31 percent year to $485.2 million in 2018. The biosimilar has also expanded its market share in the European Etanercept market to 41 percent, even surpassing that of the original product, Enbrel, and recording the largest market share in Germany. Due to the strong sales of Benepali, Pfizer's Enbrel reported sales of $2.1 billion last year, down 14 percent from 2017. Also, excluding emerging markets, sales in European countries fell by more than 20 percent in the fourth quarter.